I just got back from a busy day of running around for Dr. appointments, and other pregnancy related things. An unexpected trip to have baby's heart checked out left me in a bit of a tizzy, but all is well. Oh, I just can't wait until she is here, safe and sound, and we can all snuggle up by the Christmas tree!! 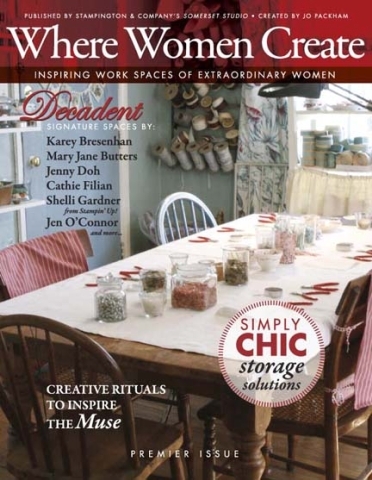 I'm sure by now, you have all seen this magazine, "Where Women Create", but oh, it is filled with such inspiring spaces! Really, it makes me feel pretty sad about my pathetic little work area in the living room. I suppose we will just call it "cozy" !! Anyway, this magazine will leave you inspired. There are tons of little interesting items and details to look at in each studio. glad all is ok.. we dont want no pregnant ladies in a tizzy around here!! isnt the magazine wonderful? I have a whole room waiting for me to make it into a craft room, but nothing to put in it yet! I’ve got to get on the ball! my kitchen table is always buried in projects! take care and have a sweet weekend. How much longer ???? how much longer do you have? yeah for christmas babies!! my second daughter was born on dec 22 (she will be FIVE this year, where did time go??) it was truly a wonderful christmas that year. i was tired but thrilled and totally in love with my new baby. thanks for reminding me of that sweet time! !